Arrived at Nanning Station for the journey to Beijing an hour early to the myriad sea of faces and joined the queue for the T190. Then we found that the push and shove was because seats are not allocated. Except for our carriage, only one of 25, standing room only in some for 1300 km. Again we were hoping not to share, had no idea what to expect but expecting the worst. Suddenly we were in the Ritz, the Carlton, the Savoy, etc. Our very own loo, in a cabin made just for two! A power point that doesn’t work and no loo paper – but who cares, we brought some with us – yippee – clever bugger me! We are now about 6 hours out from Nanning. The T190 cruises along at 110 kph. Brilliant. The scenery is ever-changing. There are massive arrays of outcrops just like those in Halong Bay in Vietnam, surrounded by huge market gardens and large sugar cane plantations. There are also many tree plantations on their hill sides which is good to see. This bit really gets us. On the left hand side of the railway track we passed a huge brick and concrete ghost town. Almost a city. In their place they are building massive high-rises. So most of the inhabitants live on the right hand side of the track – I guess until they are finished. One such city must have had 40+ cranes on the skyline looking like mozzies-netting there were so many. As we roll along, naturally there are big cities but suddenly a massive factory appears in the middle of nowhere. Amidst the greenery, with the chimneys belching black/brown smoke. At the stations we stay in our cabin as the pollution hits you in each city. But, the countryside is lovely and green. Sadly, the sun only shines in Oz it seems to have forgotten this part of the world – not just pollution but steamy as well – must be that time of the year but occasionally what look likes hedgerows of cherry blossom appear – absolutely spectacular. Many people in the fields wielding mattocks together with what looks like a cross between water buffaloes and cows – for ploughing. And then the serenity was broken. All the loos on the train overflowed. Regrettably all was not ours and the pong! Ugh. Anyway, moving on. We went up to the “Restaurant Car” a couple of times to see when they were eating and picked a moment when it was not too full. Sat down and picked up the menu. All in Chinese characters (expected) turned it over, no pictures – nothing in English –(unexpected). Beat a gentle retreat. We met a young Medical Adviser, running his own business, travelling with his mother – in –law. He spoke 50% English so we got by – very interesting man. He finally asked when we last ate and we had to confess the day before so he grabbed us and hauled us off to the dining car. Is there anything you prefer not to eat? “Duck bills, chicken entrails, fish heads, deep fried locusts and deep fried scorpion – eat most other things”. We had three dishes between us and he chose them all. When you are starving, to me they were great – not so Chris but the next day did we suffer? 100 metre dash in 3.5 secs! We finally arrived at Beijing Station. Absolutely massive. BLUE SKY. Only the third in our entire holiday. 22 million people and 100 Km across. Took me an hour to get a taxi who wanted to take us as they were all hanging out for a longer fare – understandably. Fresh, relatively cool air. Apparently SARS was taken very seriously and a massive clean up was undertaken as a result and it shows. Hectic traffic. Many bicycles – pedal and electric. 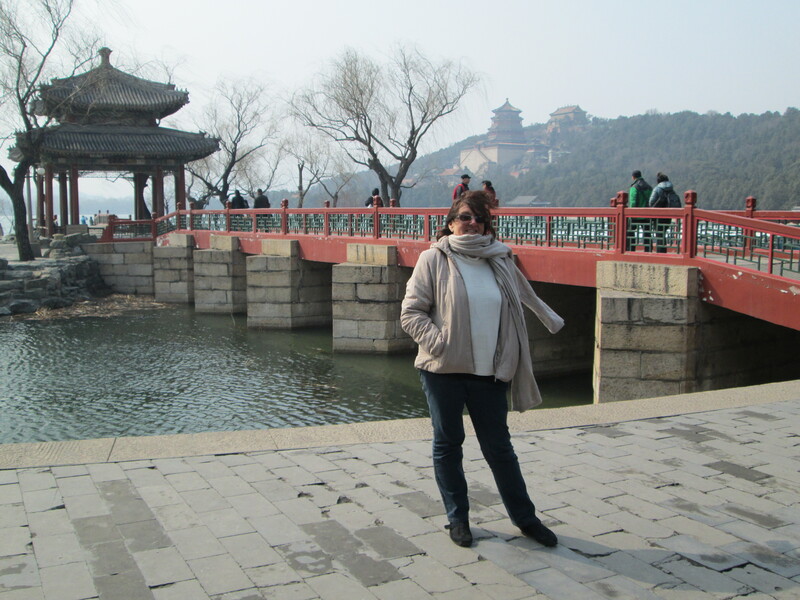 we went to the Summer Palace of the Emperor. Spectacular, but seriously you could easily spend a couple of days there. A sign on the way to the Olympic Village. Do not drive “clowsley”. Why do countries not check with a native speaker. It is a world-wide problem and really amazes me. Oh. I forgot. Last night we had to go to THE place for Peking Duck. We had it in wraps; also two beers, two other dishes and two bowls of rice. Fantastic. All for less than AUS$50. China has changed enormously in the last few years. Chairman Mao united the county and died in the Eighties. Chairman Ping is credited with opening up China and he appears to have done a great job. The road system (magnificent and as good as USA) and development of high-rise accommodation, (with the demolition of the little single storey homes and narrow little back-streets) has all been done under his auspices and naturally the per capita income has also increased. Average worker now AUS$300 per month. Average one ROOM apartment in Beijing now AUS$500,000. The demand between the average rich and the rural worker is so high but the gap is closing.Of all the places we have visited so far in our travels – Beijing is the only place we would seriously consider returning to. There is so much to see. Tips for travel in Asia. Take toilet paper, water, menthol inhaler, wipes and noodles (at least you get hot water on the trains!). Tomorrow the train leaves at 08.20 for the border with Mongolia and then to Ulan Bataan. Please, please, please be a better train – just once. 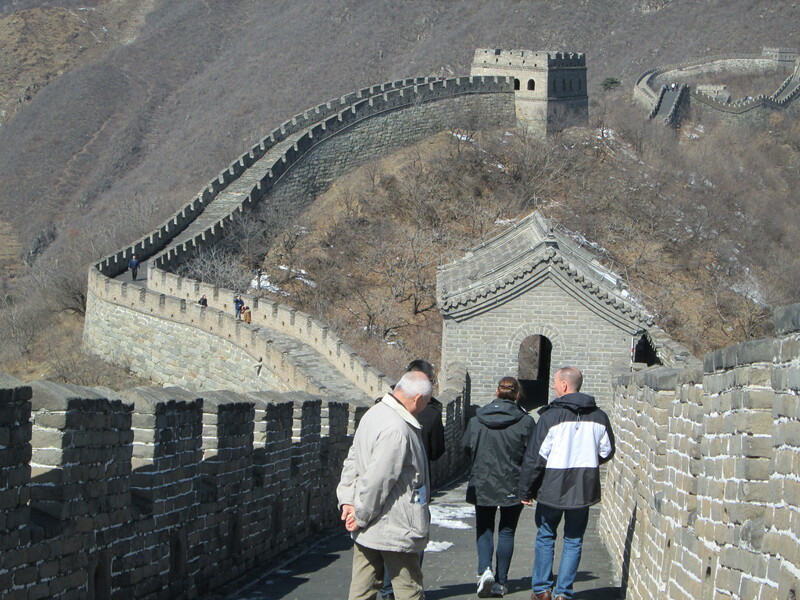 Hi Lissie The Great Wall of China is a few thousand miles long. We walked down to the first watch tower. Faraway in the distance, after another ten or so watch towers, it disappears over the hill. An elderly American couple came up as we were leaving and asked us if we had walked to the next tower (remember it was near freezing) “No, we went to the top of the mountain” – “Wow, you really walked all that way?” – “Walked? No, I ran it!” – “That’s incredible” said he – Now Lissy, be serious, do I look like I’m seventeen:)?